IBM is set to launch applications for Android, Twitter and iPhone that use real-time updates to provide a more technologically advanced Wimbledon experience than ever before. The new applications will launch on 17 June (for the Twitter client) and 22 June (for the See Android Beta App, available from Android Market). The most exciting is the Seer Android Beta, which uses augmented reality to give users of a T-Mobile G1 the inside scoop on what's happening in the tournament. 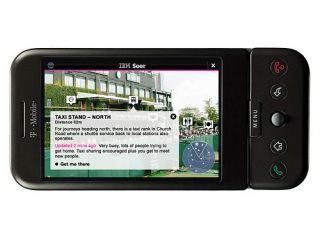 Using a video feed from the handset's camera, combined with the digital compass and accurate GPS, users can hold up the phone to different objects and information will display on the screen. By adding in information such as scores and updates on a heads up display, the user can simply point the phone at a tennis court, find out the court number and also who's playing and more crucially, who's winning. The information comes from 'net data and IBM scouts wandering around the grounds providing updates. The Seer Aggregator for Twitter will perform a similar function in diluted form, where users can subscribe to hashtags to be given information on scores, seat availability and queue length among other things. The IBM scouts, players and commentators will also be Tweeting throughout, to provide users with a rich and in-depth experience. The Wimbledon 2009 App for the iPhone will work in a much more traditional app manner, with users being given information on scores, draws, play schedules and also news and video highlights direct to the phone.